Last February, Lucky Magazine did a great DIY feature about using dye to give clothes a new lease on life, and ever since, I’ve been dying (ha!) to try it! But dyeing clothes is a little bit scary, even if the back of the box and website make it sound easy. Finally, I decided to give it a try with college girls in mind and I’m going to share my experience with all of you! I’ve done some experimenting with techniques and kinds of fabric to help you decide if dyeing is right for you. Read on for all the tips! 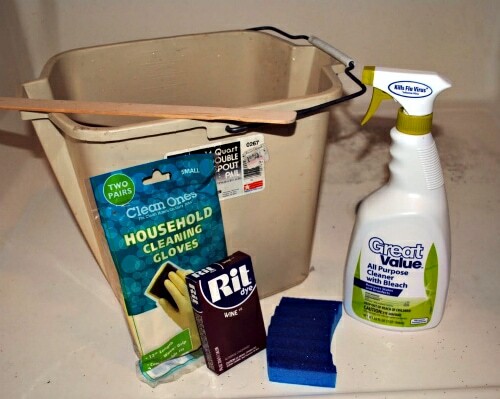 The Rit website and the packages agree that using a washing machine is the easiest way to dye fabric, however that is probably not the best option for most college students who are either using public washing machines or renting one along with their house or apartment. Instead, another popular method, which is the one featured in this article, is the bucket method, which works best for smaller pieces. For step by step how-tos with other methods check out the Rit Dye website. These instructions will be more of a summary with some tips of my own thrown in. Do not attempt to dye anything without fully reading the instructions on the label of the dye you are using. 1. Fill your bucket with enough hot water to submerge your fabric. The ratio is three gallons of water for every package of powder dye, but I only used two gallons to up the concentration and have a more potent dye. 3. Soak all clothes in hot water and uncrumple them. This step is very important because the clothes must be as smooth as possible going into the dye so that they dye evenly. 4. 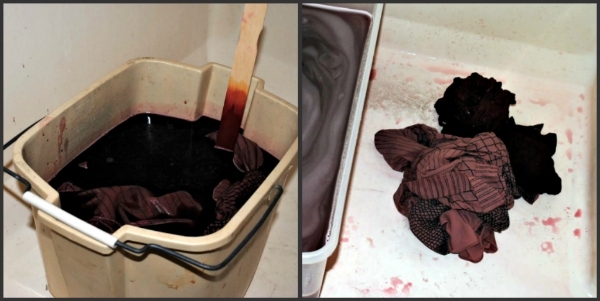 Add clothes to the dye bath. 5. Stir, stir, stir. Keep the clothes in the dye bath at least ten minutes, but as long as 30 minutes, depending on the shade you’re going for. Wear gloves as you do this so that you can handle the clothes if needed. 6. Remove the clothes and rinse, first with hot water, then cold until the water runs clear. I used a huge clear tub in the shower to do this, which contained the mess, but the process was still fairly arduous. 7. Wring out the clothes thoroughly and throw in the washing machine with a standard amount of detergent. Wash and dry as normal. 8. Clean up. I did all the rinsing in my shower in a large tub and I poured out the dye water from the tub when I was done. Everything looked a little bit pink afterwards, but using a bleach cleaner worked perfectly. There were no spots I couldn’t get out. Do take care to be thorough, though, as any dye that stays longer is more likely to stain. Both 100% cotton items, the shirt and the dress, dyed wonderfully, though they didn’t end up as dark as I expected. Even though the dress was a pink color and had both a design and lace with a different texture, the color took well. My take away from this: Cotton should be your go-to fabric if you’re seriously considering a dye job, and even if the clothes look really dark when you take them out of the dye bath, a lot of the color will wash out both when you rinse and in the wash. I was skeptical, but believe the label: Polyester does not dye well. 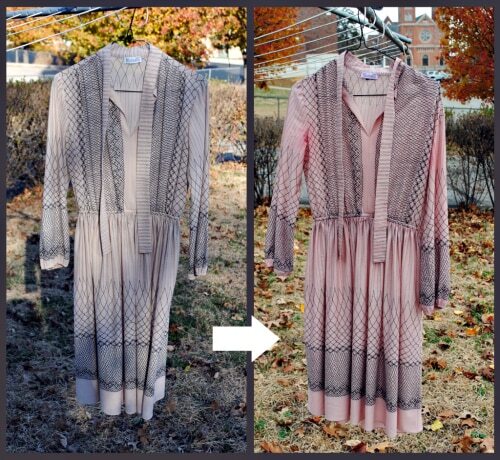 This vintage, 100% polyester dress was not ruined, but it became only a shade or two darker than its original color, despite the high concentration of dye in my dye bath. Steer clear of polyester if you’re looking for anything dramatic, but if a shade or two different is what you’re going for, give it a try! If you have some time to kill, a great piece of clothing in a so-so color, and some ambition, definitely give Rit Dye a try. But if you’re a fair weather DIY-er, take heed, it’s a lot of work, but the results can be worth it. Just make sure you have a space that you can clean thoroughly to do the dyeing in! Have you used fabric or leather dye before? Did it work? Would you recommend it to other people? Are you adventurous enough to try it yourself? Let me and your fellow readers know in the comments!